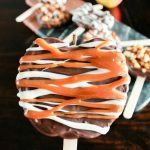 Caramel Apple Slices are a fun & easier way to eat the fall classic treat & I have 10+ Caramel Apple Slices tips & tricks you need to know in order to make the perfect Caramel Apple Slices. 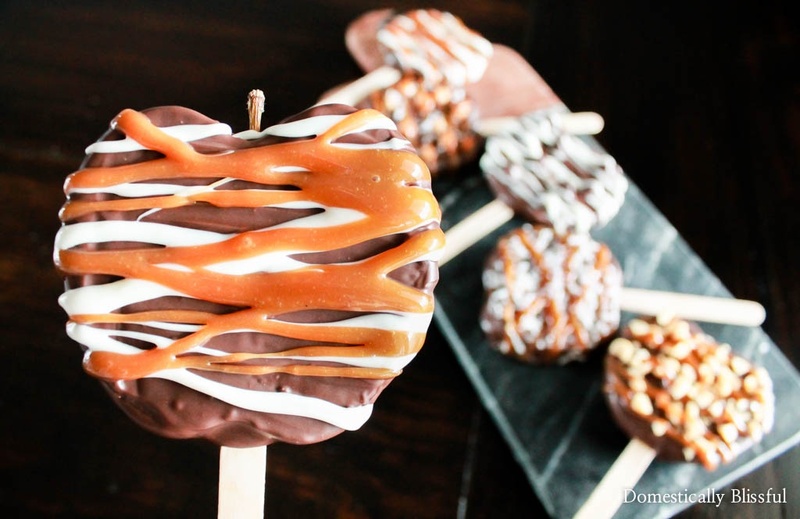 I can’t believe it’s been 2 years since I first shared this recipe for Caramel Apple Slices! So much has happened since I made them! 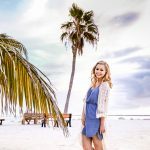 In that time this post has reached an all time high & is the most popular post on my blog! 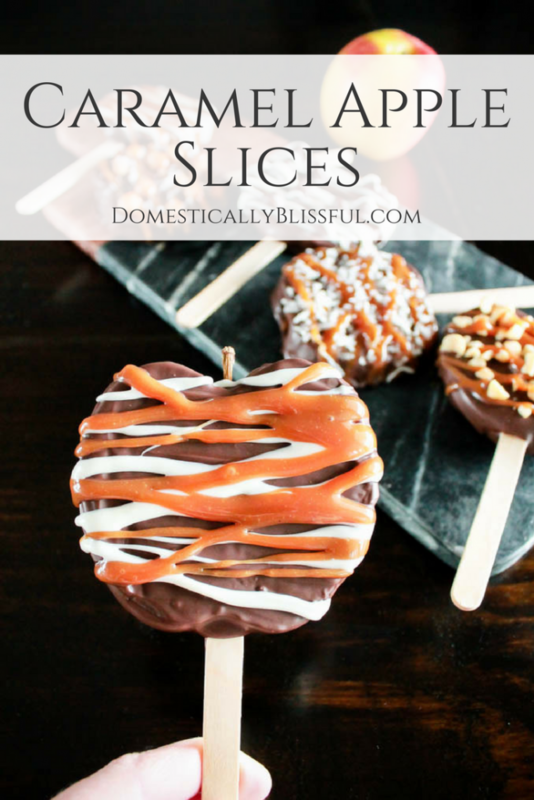 And since it is nearing 1 million pins I thought it was time that I revisited the concept of Caramel Apple Slices & share with you more details on creating the perfect Caramel Apple Slices. As you recall (or can read here), I did a lot of trial & error when creating the original post for Caramel Apple Slices. 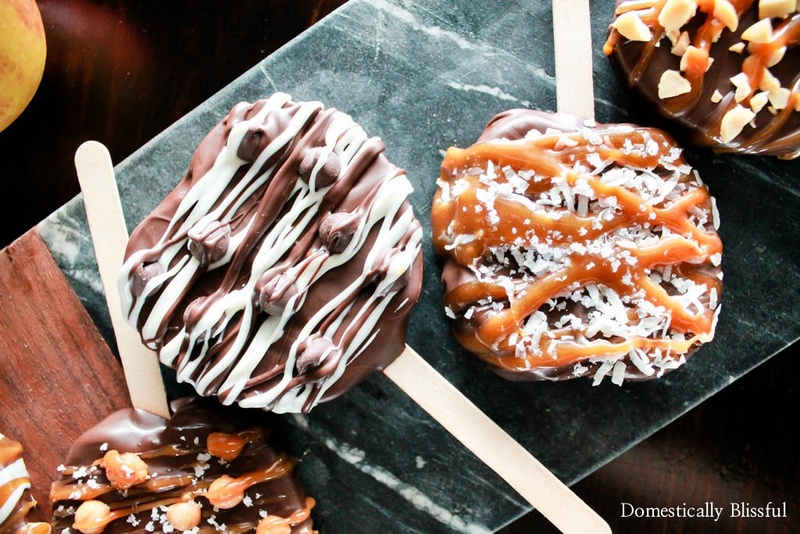 I had already learned a lot from repeatedly creating Mini Caramel Apples (& Mini Caramel Apples Revisited) over the years, so I had a really good basis for what to do when developing the recipe for the Caramel Apple Slices. And just this week I even shared a twist on the original Caramel Apple Slices & combined it with another fall favorite to create S’mores Apple Slices, which you can read here & watch here. I’ve worked on this recipe so much I know how to make it fail & succeed! 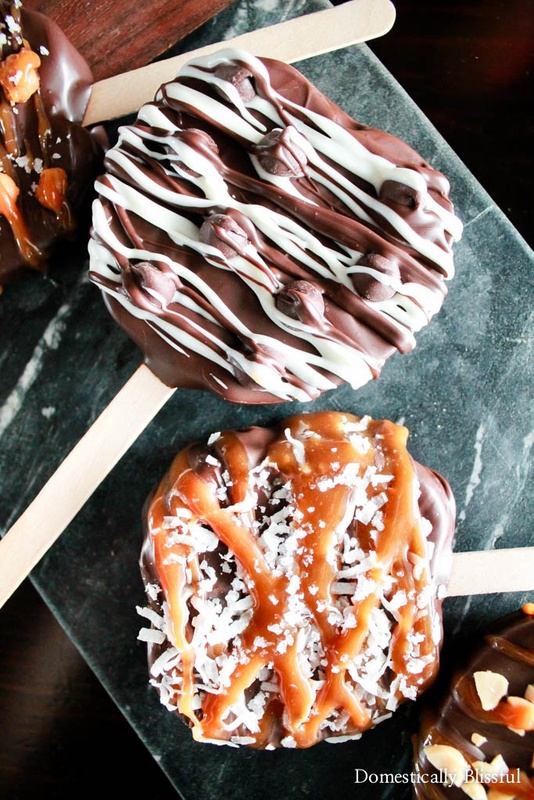 I’ve read so many comments on Pinterest from people who have tried this recipe & just from the comments I can see where some people are having trouble & the easy fix to make their Caramel Apple Slices perfect. 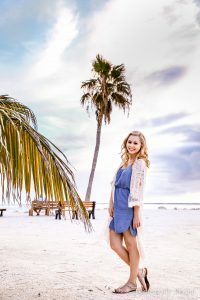 So today I thought I would share with you a bunch of tips & tricks to ensure that all of your Caramel Apple Slices turn out beautifully so that you don’t have a Pinterest fail! 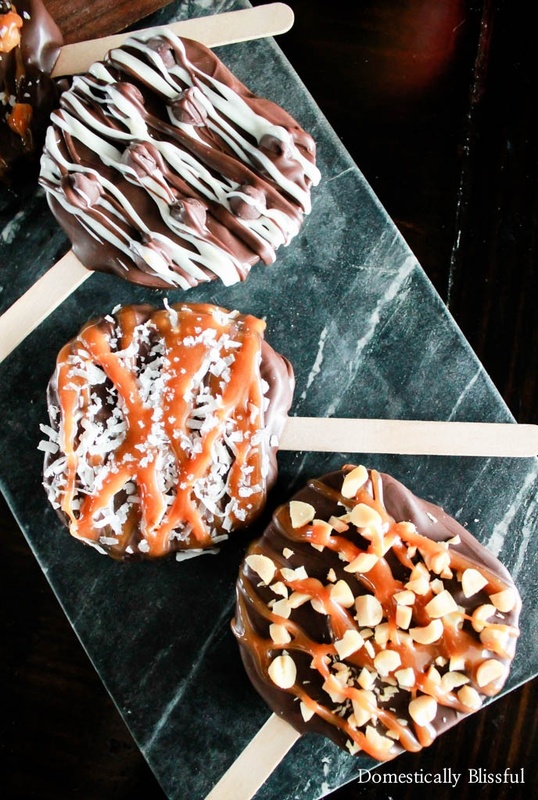 Between lots of recipe devolopment with countless trial & error attempts + four posts on the subject of exposed apples used as caramel apples I have done the testing for you so you don’t have to waste any delicious apples this fall trying to make it work. That way they will be perfect & delicious for any fall gathering, party, or fundraiser you have this season! And as always, I’d love to see your creations! Be sure to share your Fall Apple Slices with all of your favorite caramel apple toppings on Instagram & I’ll be sure to share it on Instagram Stories & tag you! This might seem like a no brainer, but it can be easy to just grab a few or a whole bag at the grocery store without feeling them to make sure they are fresh. You want to use crisp apples, fresh from the store or orchard, that haven’t been sitting around. Mushy apples are more juicy, which means they will weep more & you don’t want liquid dripping out of your chocolate apple slices. Be sure to slice from side to side, not top to bottom. I’ve had people ask, so I thought I would clarify. Better to slice thick than thin so that your popsicle stick doesn’t pop out. My slices range between 1/2 – 1 inch thick. I usually get 4-5 apple slices from 1 apple as you can see here, but this will really depend on the size of the apple. If you are going to be serving these at a party or selling them at a fundraiser this is extra important. Be sure to remove all the seeds before dipping the apple slice in chocolate. One of the most important steps to help prevent weeping apples is to thoroughly pat down both sides of the exposed apple. Patting it down will greatly decrease the chances of a wet apple slice that seeps apple liquid through the chocolate & then causes the chocolate to slide off. So pat it down super good & the once you think you have patted it down enough, pat it down some more. I can’t emphasize the importance of this step enough. The better you pat down your apple the better your Caramel Apple Slices with turn out. You can see how I do it in this video. Food safe popsicle sticks work great. I’m not sure what type of effects could occur from using normal popsicle sticks, but I figure they are labeled for food purposes for a reason. Don’t try to jab your popsicle stick into the base of the apple slice, use a small knife to slice a slit for the popsicle stick. 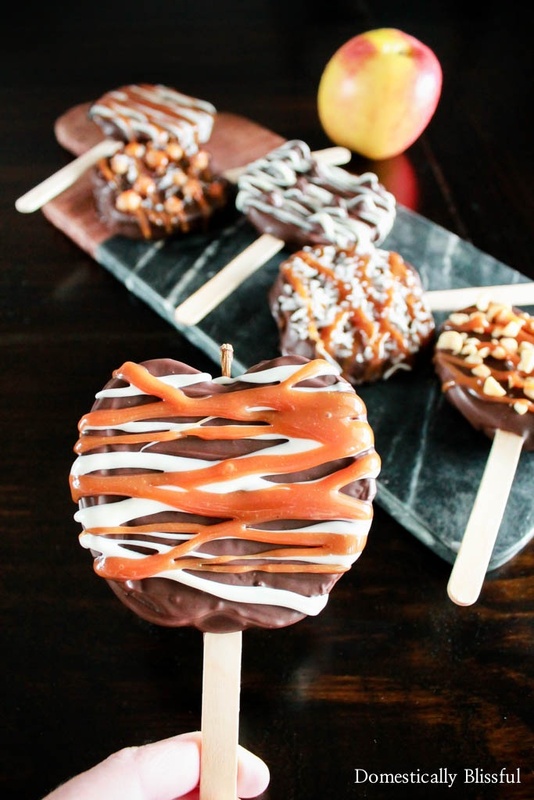 I have always & will always use melting chocolate to create these fall Apple Slices. It might be a little bit more expensive than a bag of chocolate chips, but I know it works & that I won’t waste a bunch of apples while trying to work with the other kind. 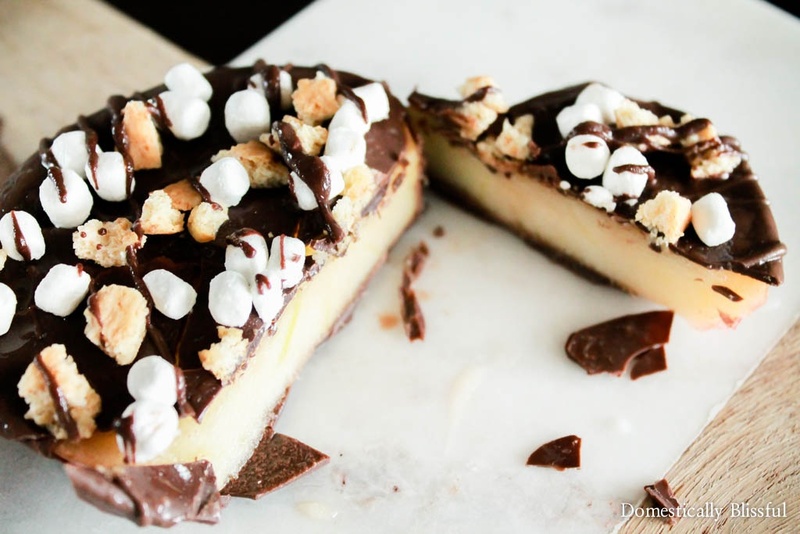 Plus, melting chocolate melts easily & quickly, tastes good, & looks beautiful too! The reason I recommend you start with a chocolate base is that it sticks the best to the apple without weeping off. I’ve had a lot of experience with caramel & exposed apple, which you can read about here, here, & here. 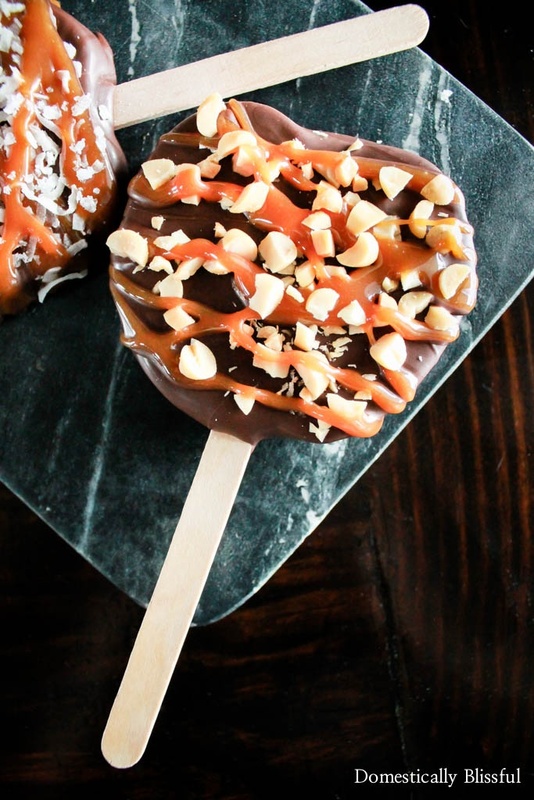 Allow some of the chocolate to drip onto the stick, this will act as a sort of edible glue that holds the stick & apple together. Be sure when you dip/pour the chocoalte over the apple that you remove the excess chocolate from the apple slice. You can see how I do this in the video. In this post I shared how you could use butterscotch, but how even still it wasn’t as good of a base as the hardened melting chocolate. 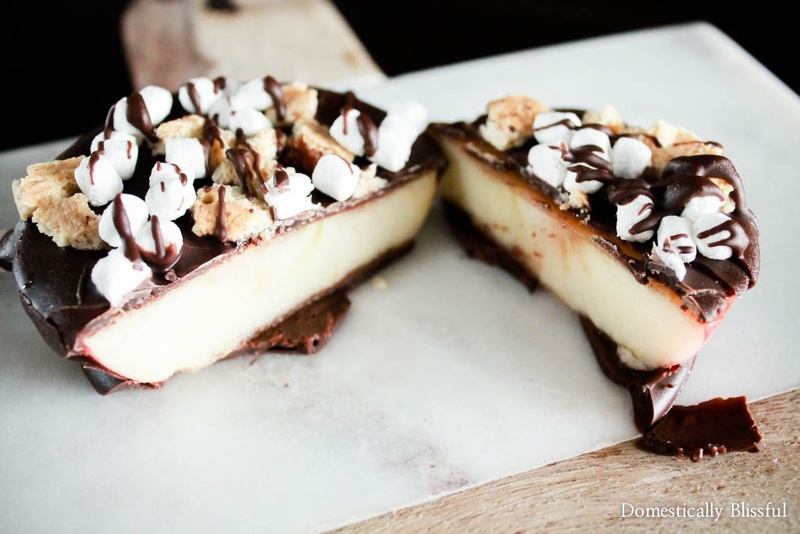 In this post, I also showed you a picture of what happens if you try to completely coat your chocolate covered apple slice with a layer of caramel. Pretty much disaster. I recommend that you drizzle & sprinkle all of your toppings onto the chocolate apple slices. 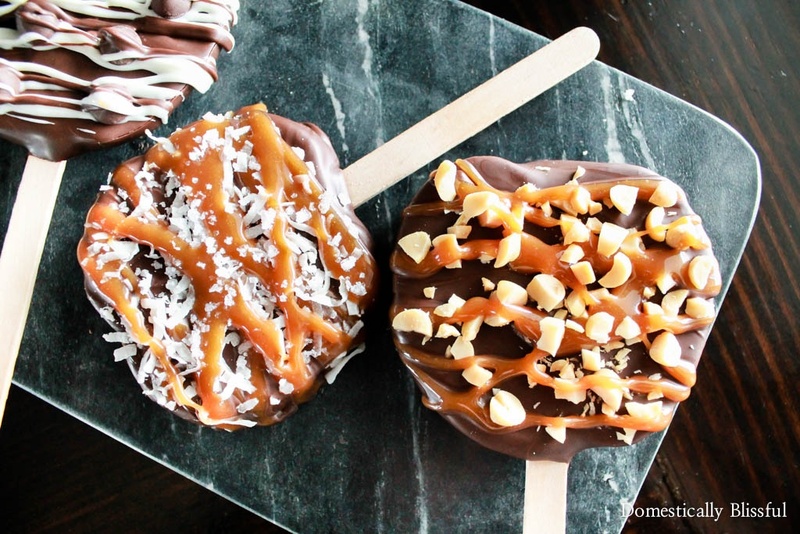 And be sure to use slightly cooled caramel so the chocolate doesn’t melt off. For the best results I reccomend that you make them the day of or just before serving. I have however had success in making these ahead of time. On 3 occasions I have saved a few to see how they held up over the many days after making them. 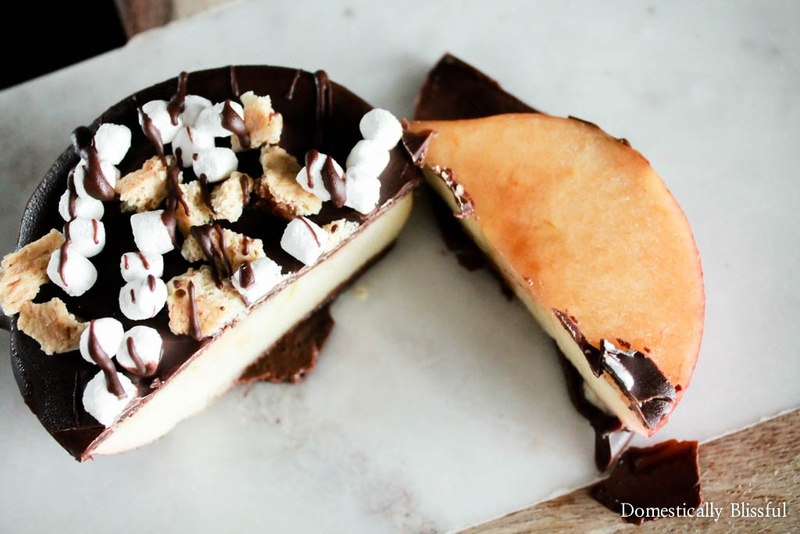 After I made the S’mores Apple Slices I placed 1 in the fridge (uncovered) & 1 in the freezer (uncovered) on a Wednesday. I then promptly forgot about them until the weekend. I checked the one in the fridge it was still in tact. And then I got distracted & forgot about them again. Above is a picture of them the following Thursday (8 days after making them) & this is how they look. The top two are photos of the apple slices left in the fridge & the bottom two are the frozen apple slice. I waited to photograph the cut open frozen slice until it was thawed enough to cut into. Also, I removed the top layer of chocolate so that you can see the condition/color of what the apple looks like below the chocolate layer. Now I am definitely not recommending that you wait that long to serve them! Definitely not!! I just so happened to forget about them & these were the results. If this is your first time making them I highly encourage you to make them the day of your event, however, if you want to test it like I did. I say give it a try with any leftovers you have or with 1 apple well before your party or event! But just remember, I recommend you make them the day of for the best results. 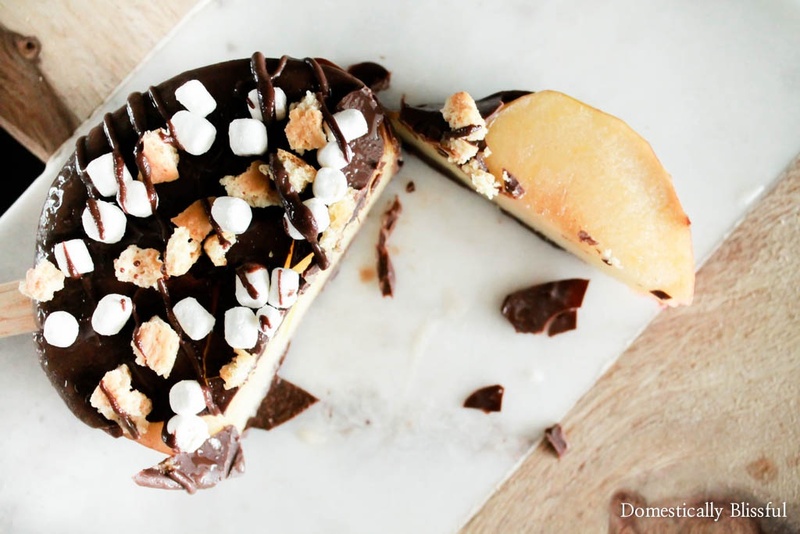 Cover each apple slice in melted chocolate & place on a piece of wax paper to dry. Continue this process until all of your apples are covered in chocolate & have hardened. 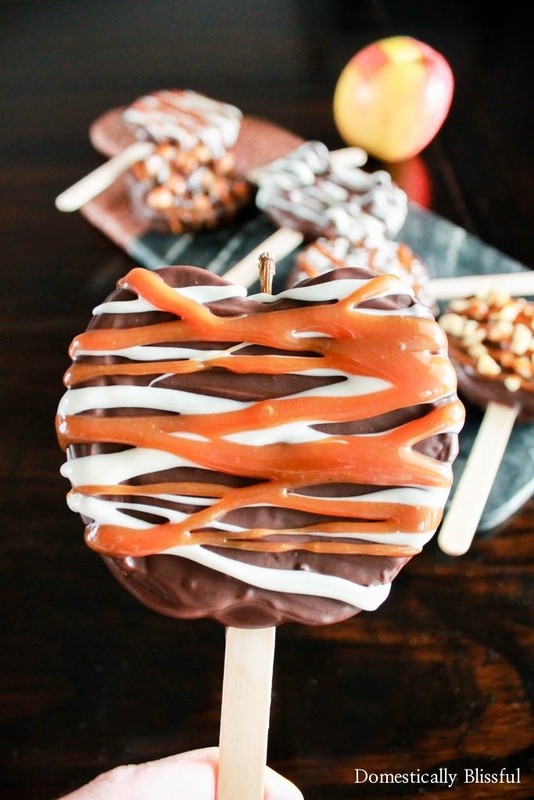 Be sure to read & follow all 10 tips for perfect Caramel Apple Slices. Oh goodness! I see how that can be confusing! What I meant was that you want to slice the apple from one side to the other side, moving your knife from the right side across to the left side of the apple when you cut them into slices. Rather than turning the apple on its side & slicing the top half & then the bottom half, which leaves seeds & a crunchy core in each slice. You would be surprised how many people did this after I shared my first post, even after looking at the pictures, as you did, for clarification. I hope that helps! 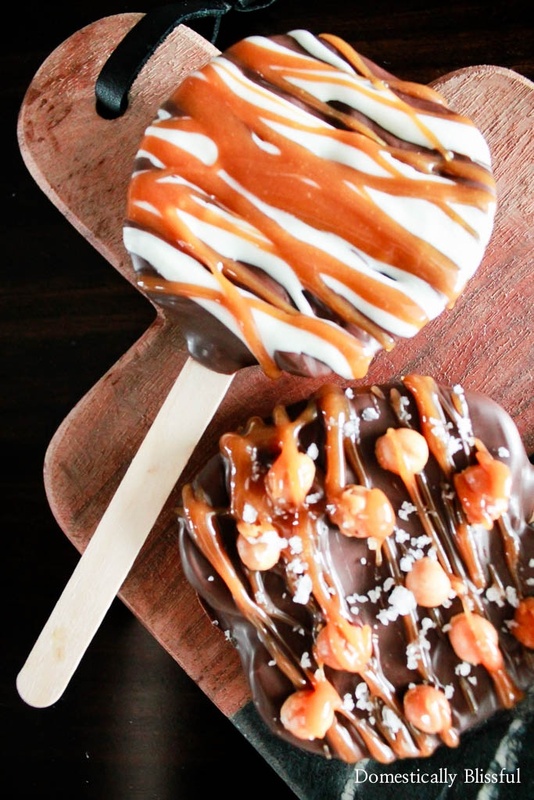 You want the chocolate to dry completely before adding the drizzle of caramel, butterscotch, or white chocolate because the chocolate acts as a protective layer between the exposed apple & toppings. However, if you are only adding sprinkles, nuts, etc. then you would add that while the chocolate is still wet. When I add both caramel & nuts I add some nuts while the chocolate is wet, then I let it harden, & then I add the caramel drizzle & the second sprinkling of nuts.